Authorized Makita Dealer, Warranty & Free Shipping!! Not included box,manuals or anything else. We try to describe them to the best of our knowledge. Good Luck. 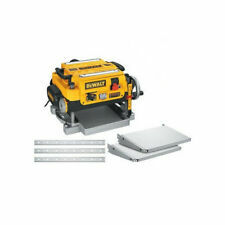 Includes power planer, dust bag, a kickstand, a parallel fence bracket and a 2-year warranty. The quality of the HSS is top notch and second to none. The blades are ground with both a primary 40° bevel and a secondary 45° bevel close to the edge. The three blades are razor sharp and ready to go. 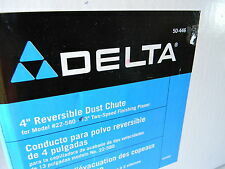 Delta item #50-446. This is a 13" dust collection hood for the 22-580 planer. It is ideal for professional construction framing, window and door installation, and fine woodworking. Makita KP0800K "A Grade" 3-1/4" Planer Kit. Machined aluminum and balanced planer drum for reduced vibration and added durability. This electric planer runs on 110 Volt power and runs at 15,000 RPM. The contoured top handle and convenient trigger switch make for easy operation. At 30,000 cuts per minute, this power planer will make quick work of any project. RYOBI 6 Amp 3-1/4 in. Corded Hand Planer #HPL52. •What you see in the picture that is what you will receive. •With Carry Bag. "High Speed Steel (HSS) Knives" stay sharp and last longer than conventional product. Made of High Speed Steel for longer cutting life. The blades are ground with both a primary bevel and a secondary bevel close to the edge. The blades are razor sharp and ready to go. Thickness -.068". New sprockets for Craftsman planer. Remove the top two screws on the end that doesn't have the crank. Take off the side piece and you see the chain. Sprocket goes on easily, put back together and you're as good as new. Model: 126. Well, we are human and can make mistakes. Our industry is closely regulated and monitored. That should reassure you. The item has been tested and does function properly. Flat rate boxes are not used. Swivel casters on two corners provide excellent maneuverability. The bolt pattern on the fixed caster side allows orientation of the wheels in either of two directions. The unique two piece retractable feet use rare earth magnets to allow the knob to turn while the foot pad is tight to the floor. Makes loading a new set of knives much easier and more accurate. This set of jigs uses powerful magnets and micro-adjusting ability to set planer knife blades to within 0.001". Fixture can be used in most planer, thickening machine or combination machine. Makita: 1001, 1100, 1125, 1125B, 1911, 1900B, 1901, 1902, 1923B, M102, MI900. KP0800K, KP0810, LXPK01, LXPK01Z, N1900B, N1900BK. Dewalt: DW680, D26676, 26677K. 3-1/4" 82mm Planer Blade For Makita 1900B 1911 Hitachi F20 Ryobi Part - 1 Pair. Used, in good, working condition. Planer is tested and works well. 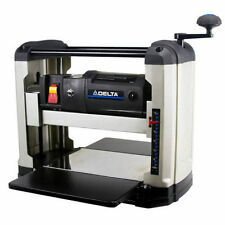 Delta 37-070 6” Variable Speed Bench Jointer Pre-owned. Working condition. 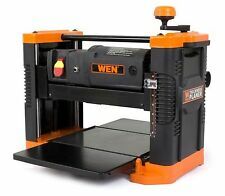 Equipped with a contoured top handle and convenient trigger switch, this wood planer is easy to operate and use. Wood planer is equipped with a contoured top handle and convenient trigger switch, this wood planer is easy to operate and use. DEWALT 5.5 Amp 3-1/4 in. Portable Corded Hand Planer. NO APO, NO P.O. Boxes. PART NUMBER. High Speed Steel (HSS) Knives" stay sharp and last longer than conventional product. The three blades are double edged and are ground with both a primary bevel and a secondary bevel close to the edge.The primary angle is 45 degrees with a secondary relief angle of 40 degrees. Equipped with a contoured top handle and convenient trigger switch, this wood planer is easy to operate and use. 1 x Electric Planer. Power: 800W. Use For: Woodworking. Cable length: 78.7"/2M. We are committed to resolve all issues in a friendly and satisfactory manner. The blades are ground with both a primary bevel and a secondary bevel close to the edge. These blades are razor sharp and ready to go. Thickness -1/16". Ridgid TP13000 13" THICKNESS PLANER, Needs 1. Ridgid TP13001 13" THICKNESS PLANER, Needs 1. 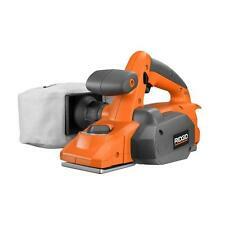 Ridgid TP13002 THICKNESS PLANER, Needs 1. 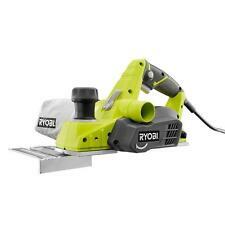 Ryobi 13" Planer AP1301. The blades are ground with both a primary bevel and a secondary bevel close to the edge. Trending at $26.29eBay determines this price through a machine learned model of the product's sale prices within the last 90 days. The blades are ground with both a primary bevel and a secondary bevel close to the edge. The blades are razor sharp and ready to go. Thickness -1/16". "High Speed Steel (HSS) Knives" stay sharp and last longer than conventional product. These blades are razor sharp and ready to go. The primary angle is 45 degrees with a secondary relief angle of 40 degrees. DeWalt HSS Planer Blades for DeWalt 12.5" Planer DW733, DW7332 Set of 2. 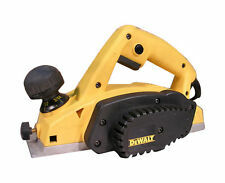 Fit 12.5" Planer - DeWalt DW733. 12.5" x 1-1/16" x 1/8", High Speed Steel, single edge, honed cutting edge, 2 piece set of blades. 10 x Planer Blades. Quantity: 10pcs. Material: hard alloy. We will do our best to reduce the risk of duties. Sharp blade fit for cutting soft woods, hard wood, ply-wood board etc. Suitable For: MAKITA-BOSCH-B&D-HITACHI. Skil 3” 100 Plane Heavy Duty Planer 7.5 Amp Type 4 Surfboard Planer Condition: Good pre-owned condition without box. Please carefully review all the pictures as they are the highest descriptions I can provide. The picture you see is the exact item you will receive. Note: Before buying or bidding but you require further information regarding the item please don’t hesitate to contact me. Also, if you have time please feel free to browse my other items for sale. Thank you very much! Delta # 1342156 This is an OEM cutterhead pulley for the following Delta planers: 22-560 type1 and 2, 22-565 type 1, TP400LS type 1. It includes a new locating key. Those of you familiar with Byrd cutterheads know the virtues of the Shelix design. Made In USA and sold by authorized Byrd distributor. Uses (40) standard Byrd 15x15x 2.5mm 4" Radius inserts (KN-400).